008: You have the chance to tip the scales! Discover Would You Rather 008: You have the chance to tip the scales! This week Caitlin hosts and Sean, Graham, and Chris fight about whether it's better to have or be a dragon (spoiler alert, the only thing EVERYONE agrees on is that Falkor stinks). What if you could have a dragon that would be uncontrollable or be a very small dragon. Well, we recorded this episode one full time first and lost it due to technical difficulties. So if you don't think this was funny, just assume we used up all our jokes the first time through. Graham shares the best size for a dragon. Caitlin shows her darker side. We all learn about Twitter. Or check out all sorts of fun stuff at our Facebook page. Episode NotesOne of the most fun parts of Would You Rather is coming up with the scenarios. That being the case, we thought we'd share some of our process and see if you liked it.If, by some strange happenstance you do, let us know!Check out the super fun newsletter.Connect with us:Tweet us at @itsratherfunCheck out all sorts of fun stuff at our Facebook page.Sign up for the newsletter. Brainstorming: Let's try something crazy. Episode NotesThis week Chris, Elzie, Sean, and our good friend, Jeshua, discuss the idea of a getaway to the moon or somewhere on earth.Check out more about this scenario here.Modifiers from this time around:What if you could take 1 person with you? What if you had to go alone?There is also no oxygen on Earth either.What if there were no more people on earth because they’re all in moon settlements?Highlights:Elon Musk's moon prison.Jeshua plans a moon heist.Space diapers, space toilets, and space poop.Connect with us:Tweet us at @itsratherfunCheck out all sorts of fun stuff at our Facebook page. Episode NotesA relatively tiny crew of Caitlin, Elzie, Sean, and Chris gather to discuss whether it would be better to only be able to consume (and get all your nutrients from) gingerbread or eggnog.Modifiers from this time around:What if you could make your choice taste like whatever you want it to?Highlights:Caitlin's a little tired (from making cookies)... and a little sassy.Elzie proposes a rooster-based replacement for the censorship bleep.Sean and Elzie wretch when thinking about eggnog.We don't know how eggnog is made.Connect with us:Tweet us at @itsratherfunOr check out all sorts of fun stuff at our Facebook page. 013: Now that's using your noggin! Episode NotesKeenan joins us (Caitlin, Schuyler, Sean, Elz, and Chris) for the first time to talk about whether it's better to have eyes in the back of your head or see with your eyes closed?Modifiers from this time around:What if you always had to see when your eyes were closed or could only have one set of eyes open at a time.When your eyes were closed you could have x-ray vision and the eyes in the back of the head could shoot lasers.What if you had eyes in the back of your head but every time you sneezed the pair of eyes you had open swapped (and you couldn't swap again until you sneezed).Highlights:Lots of our followers are afraid for their lives, and their answers mainly focus on how they might best protect themselves from ninjas, monsters, etc.Haircuts would be a much more dangerous thing with eyes in the back of your head.Connect with us:Tweet us at @itsratherfunOr check out all sorts of fun stuff at our Facebook page. Episode NotesA very special 10 year old guest joins Graham, Sean, and Chris on the podcast to discuss the merits of super speed vs super strenght.Modifiers from this time around:What if you could only use super speed going backwards?What if you had super speed but had to sleep 18 hours a day?What if you constantly sneezed while using super strength?What if smoke came out of your ears while using super strength?Highlights:Elz is hilarious and does a couple accents!Connect with us:Tweet us at @itsratherfunOr check out all sorts of fun stuff at our Facebook page. Episode NotesThere's a full house this week as Caitlin, Schuyler, Sean, Chris, Graham, and Inessa gather round the ol' podcasting fire to talk about whether it would be better to eat all your food in taco shells or in smoothies. Hilarity ensues.Modifiers from this time around:What if you could keep 1 item outside of your smoothie?What if you had to eat either your tacos or smoothies with chopsticks?Highlights:None of us know anything about chopsticks (except Graham).Are savory smoothies really just soups by another name?We spend too much time talking about our favorite soups.Caitlin unveils her new podcast signoff, and the gang approves.Connect with us:Tweet us at @itsratherfunOr check out all sorts of fun stuff at our Facebook page. Episode NotesAfter an extended and unexplained (let's say mysterious) hiatus, Chris, Caitlin, Schuyler, and Sean are finally back talking about the hottest would you rather questions. This week, the crew debates whether it's better to be a half human half chicken, or a half human half slug.Modifiers from this time around:What if your slug slime let you slide around really fast like iceman?What if the animal part was your top half and the human part your bottom half?Highlights:3 out of 4 of us have no idea how slugs move.Caitlin offers fashion advice for chickens.Connect with us:Tweet us at @itsratherfunOr check out all sorts of fun stuff at our Facebook page. 009: Like a centaur, but less so. Episode NotesThis week Caitlin hosts and Sean, Graham, and Chris fight about whether it's better to have or be a dragon (spoiler alert, the only thing EVERYONE agrees on is that Falkor stinks).Modifiers from this time around:What if you could have a dragon that would be uncontrollable or be a very small dragon.Highlights:Well, we recorded this episode one full time first and lost it due to technical difficulties. So if you don't think this was funny, just assume we used up all our jokes the first time through.Graham shares the best size for a dragon.Caitlin shows her darker side.We all learn about Twitter.Connect with us:Tweet us at @itsratherfunOr check out all sorts of fun stuff at our Facebook page. Episode NotesChris, Sean, Graham, Inessa, Caitlin and Schuyler try to figure out which would be better, to be a giant or to be invisible.Modifiers from this time around:What if you were invisible but cast a shadow?You’re invisible, but REALLY loud?What if you could turn either being a giant or being invisible on and off?As a giant, you could choose to hover around 10’ off the ground, so you’d never actually have to crush people.Highlights:The crew discusses Shaq week.Caitlin says giants don't have friends.Some deep conversation about whether your clothes would be invisible as well.Chris learns who Willie the giant is.Connect with us:Tweet us at @itsratherfunOr check out the best Russian propoganda around at our Facebook page. 007: Where'd You Go? Oh... There You Are. Episode NotesChris, Sean, Graham, and Schuyler try and get to the bottom of which is preferable, sneezing fire or crying slime.The question this week comes courtesy of the brilliant Than, whose organization Unseen is doing inspiring work supporting organizations combatting human trafficking.Modifiers from this time around:* What if fire propels you backwards but slime was in no way washable? * What if the fire was purely cosmetic? * What if the slime was edible?Tweet us at @itsratherfunOr check out the best Russian propoganda around at our Facebook page. 006: I'm Not Crying, You're Crying. Episode NotesGraham, Sean, Inessa, Caitlin, and Chris get into some deep discussion about whether tis better to be a humongous hamster or an itty bitty rhino. If you like what we're doing here, please leave a review on your podcast player of choice.If we've changed your mind, or you think you can change ours, connect with us on Twitter or Facebook. Episode NotesFull disclosure, Chris called in from vacation for this week's episode and his audio sounds terrible. He also screwed up the newsletter this week, but hopefully we can give him a pass since he's living la vida loca.Today, an expanded crew of Graham, Sean, Inessa, Caitlin, and Chris debate the question of would you rather have a mask that let you see with anyone's eyes or speak with anyone's voice.Completely without context, here's something you should check out: BoBoPatch is Born.If you like what we're doing here, please give us a review or tweet at us at @itsratherfun. Episode NotesThis time around, Schuyler, Graham, Sean, and Chris debate the merits of a compliment vs $100 dollars, the going rate of different types of compliments, plus Schuyler gets a compliment from J.K. Rowling...ish.This week's question was submitted by Austin Saylor. 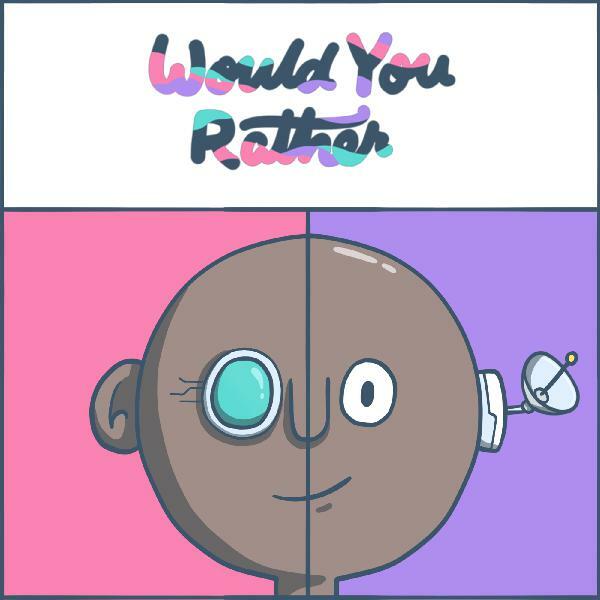 He has an amazing lettering animation course at AustinSaylor.com.Sign up for weekly Would You Rather scenarios and submit your own answers at wouldyourather.fun. 003: You're Money or Your Money. Episode NotesThis week, Schuyler, Graham, Sean, Reid, and Chris tackle the hard question of whether they'd prefer a human head and dog body, or a dog head and human body.All sorts of interesting questions emerge. Do you have your human consciousness in both scenarios? 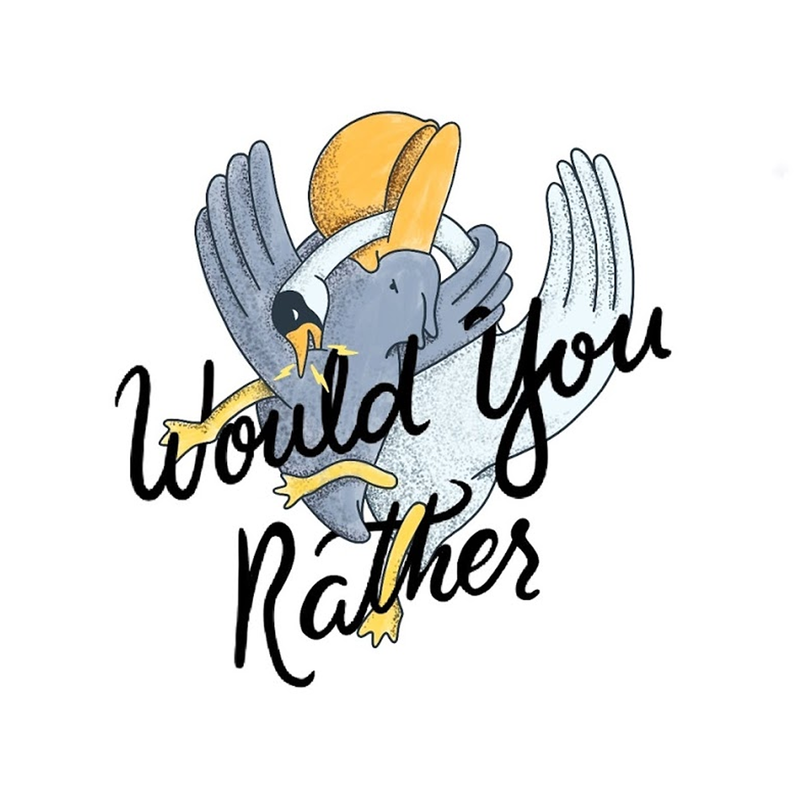 Are the dog heads to scale?Make sure to check out Austin Saylor's amazing lettering and animation work at AustinSaylor.comFind out more on the Would You Rather website. 002: A dog head and a human body or a human body and a dog head. Episode NotesEyes, a neat book from Mike Smith (@mesmithdesign): http://www.dadsigner.com/product/eyes-book/A very nice tweet from @jakebarry: https://twitter.com/jakebarry/status/1013964610918068224See you laterz. 001: 8 eyes or an elephant trunk?